Need more desktop space but don’t have the option of installing an internal video card in your laptop? Or perhaps you simply don’t want the hassle of installing a video card in your desktop computer? You can easily connect an additional monitor, LCD display or projector to your computer with a USB video adapter from Byterunner.com. You’ll be amazed by the multiple ways in which dual-monitor capability will significantly enhance your work life. With one of these simple USB video adapters, you can enjoy optimal display continuity while viewing spreadsheets, have extra space for tools & palettes and view charts and live data or documents and reference materials at the same-- without ever having to overlap windows. Just think of how much time you would save if you could read an email and open an attachment or surf the internet on an additional monitor simultaneously! Travelling for business? Our USB video cable adapters make multiple screen presentations and exhibitions a snap, eliminating the need to lug an extra computer around on your travels so that the only thing you’ll have to worry about carrying is your work. 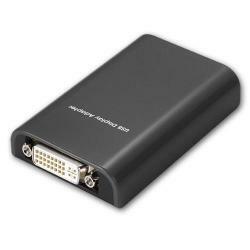 These USB 2.0 video to DVI or SVGA adapters are also great for entertainment. Get additional perspectives while playing games or watch videos and TV on one screen while reading reviews, monitoring live feeds or gaming on the other. And when you use your video adapter used in conjunction with our other connectivity products, like those designed for USB video capture, you’ll see your computer’s potential expand even further! We offer many different USB serial cable options as well. Add an additional HDMI port to your system. Allows you to have two separate screens (or more).